Natural Estrogen Foods? : Take a Look at This! When planning menus, we don’t always think about foods that increase estrogen. However, women require estrogen not just for conceiving children, but also after childbirth and especially during menopause, when estrogen levels tend to decrease significantly. Why do you need estrogen exactly? If you’ve got too little estrogen in your system, you’re at higher risk for osteoporosis in addition to some inconvenient and uncomfortable things like vaginal dryness. Your heart, blood vessels, bones, skin, muscles and hair all like to have estrogen in your system to function optimally. Getting your estrogen fix from phytoestrogens (foods that mimic estrogen in the body) is nothing new. Phytoestrogens are plants with naturally occurring hormones that your body turns into estrogen, most of the time anyway. Jill Blakeway, a licensed acupuncturist and clinical herbalist and co-author of Making Babies: A Proven Three-Month Program for Maximum Fertility cautions on Babycenter, “Some soy isoflavones work as an estrogen blocker but others mimic estrogen – meaning the body thinks it is estrogen. This can cause health problems and make a hormone imbalance worse.” Therefore, as usual, we recommend that you chat with your doctor before going nuts (pun intended—see number 15) on the legumes on this list of 15 foods to increase estrogen. Soy is one of the richest sources of phytoestrogens on the planet, and therefore one of the foods that increase estrogen. Reach for tofu, soymilk or edamame to get your fix. Flaxseeds are said to provide three times more phytoestrogens than soybeans but your body will have trouble absorbing them unless they’re ground up prior to consumption. Also called linseed, you may find them added to cereals and breads or enjoy them sprinkled on your oatmeal or yogurt. Delicious, nutritious seeds are not just for the birds, they happen to be great foods to increase estrogen. Sesame seeds and sunflower seeds also help to boost estrogen levels in the body and they taste great as crunchy salad toppings. Peas, pinto beans and limas all contain coumestan, another type of phytoestrogen. They’re also just really healthy so you should be eating them regularly anyway. Garlic is actually a member of the onion family and, like onions, is full of isoflavonoids. Plus, you’ll keep away vampires and ward off heart disease. Dried stone fruits and dates have a much higher concentration of than their fresh counterparts. If eating prunes is making you feel ancient, keep in mind that they’re just dried plums after all. Tomatoes, kiwi, citrus fruits, cantaloupe, peaches, artichokes, bananas, asparagus, corn and cauliflower all boast great levels of vitamin C and they possess the phytoestrogen power you might be looking for to boost your estrogen. B vitamins are good for you regardless. They help with stress management and your metabolism so eat up on the beef, oats, Brazil nuts, potatoes, liver, tuna, turkey, avocados, bananas and kefir. In case you hadn’t heard, white flour isn’t so good for you. Whole grains are much better for our overall health but can also help with your estrogen levels as an added bonus. And who doesn’t like a free bonus, right? You don’t need to tell us twice, we’re all over the benefits of coffee consumption. From reduced risk of diabetes to a lower chance of Alzheimer’s, bottoms up! 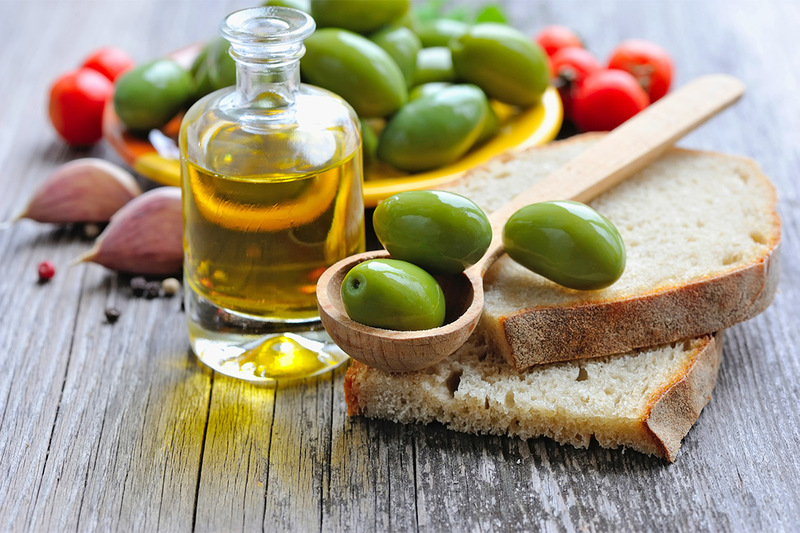 Olives and their lovely oil are healthy for your hair, skin, nails, heart and a million other things we’re sure but they’re also great for your hormone levels. Beets are delicious and nutritious and, like many other root vegetables, have the compounds to support healthy estrogen levels in your body. Don’t like them? Grab the sliced ones in the can and call them cookies. It worked on us when we were in preschool, it might just work now. Yams give us vitamin B6. Why do we love B6 specifically? It’s an essential vitamin that helps relieve premenstrual syndrome symptoms up to and including depression. And they’re yummy with marshmallows, right? Common herbs and spices that are also phytoestrogens include: parsley, anise seed, red clover, thyme, licorice, turmeric, hops and sage. Season liberally to raise estrogen levels in your body naturally. We hear pistachio nuts are richest but cashews, chestnuts, hazelnuts and walnuts all contain phytoestrogens which make them all great choices.